QuickBooks for Mac 2013, Intuit’s business finance application for the Mac, offers an incremental update to last year’s version, with some small but welcome additions and enhancements to existing features. Though QuickBooks for Mac remains on its own financial island—related in name but not in file format to its nearly eponymous Windows version—the new version is a good tool for taking care of your business’s financial matters. QuickBooks' look and feel are similar to those provided by the flowchart interface in the Windows version of QuickBooks, as well as to those of Acclivity’s AccountEdge. The flowchart interface organizes various business tasks into logical groupings: vendor-, customer-, employee-, company-, and banking-related tasks. For example, in the Vendor section, you can create a purchase order for inventory items; and when the items arrive, you can use the Receive Inventory button to add them to your inventory, and then use the Enter Bills Against Inventory button to process and pay the bill. Whether you’re a QuickBooks novice or a long-time user, Intuit makes it easier to get your business information into QuickBooks 2013 from its current location. A new import option lets you quickly take data stored in a CSV file or in your Mac’s Address Book app, and add it to QuickBooks. QuickBooks 2013's new document attachment feature lets you link existing documents to customers, vendors, invoices, and more. Importing from the Address Book is fairly straightforward; CSV import is less so. To import from Address Book, open the Add Contacts, Products And Services tool and choose Add From Address Book. Then select the vendors, customers, and employees you want to add, and QuickBooks will automatically map your Address Book data to the proper fields in QuickBooks. Technically, CSV import is not an import but a copy (from your CSV file) and a paste (into the import tool). The method works well, but you'll need to prep your spreadsheet beforehand, to ensure that the fields match the field order presented in QuickBook’s import tool. Integration with the Intuit Payment Network is new to QuickBooks 2013, as well. It allows customers to pay without having to write a check. Setup for the Intuit Payment Network is free; and once you have an account, you can add links to your invoices that customers can use to pay. Payment typically posts to your bank account the next day and the 50-cent fee you pay for each transaction is less than you might pay for credit card transactions. QuickBooks 2013 then downloads all transactions paid through this network and reconciles them internally. Another new feature in QuickBooks 2013 allows you to link scanned receipts and other external documents (such as Word and Excel files) with customers, vendors, employees, estimates, and invoices. You can tag linked documents to make them easier to find, and to simplify the task of associating documents with their related jobs or contacts. Unfortunately, data files for QuickBooks 2013 are not the same across all versions of the software, so employees using Macs and PCs can't work in the same files. On the other hand, you can “roundtrip” your company file from a Mac to a PC without losing data or information. The process involves backing up your file as a QuickBooks for Windows file and then using the Windows version of QuickBooks to restore it. This operation, while by no means impossible, is inexcusably clumsy in a world where virtually all data files are platform agnostic. QuickBooks 2013 still has some bugs that I mentioned in my review of last year’s version of the program, as well as other issues that are new to this edition. In the realm of old bugs, QuickBooks 2013 has a problem with the toolbar appearing on the screen. On my system, the toolbar occasionally appeared in the middle of the screen when I opened the program. Intuit had the same problem during its Macworld demo; the company stated that the underlying issue involved some leftover code, and indicated that it hoped to fix the problem soon. New bugs include a couple of quirky glitches. First, clicking the check register button in the banking section did nothing, no matter how many times I clicked it. After spending some time with the program, I discovered that I had to hang my mouse over the button and select a default account before the button would work. Second, before I had an online banking account set up, the program's online account setup feature displayed a duplicate account setup dialog window that I couldn't dismiss without forcing the application to quit. 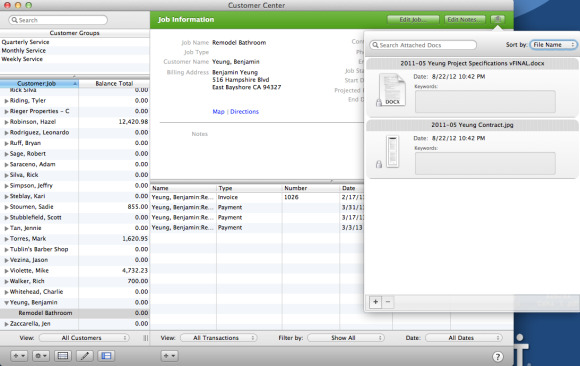 With each new release, Intuit improves QuickBooks for Mac. I like the 2013 version better than any previous version of the program. New import features, the option to attach external documents, and the addition of the Intuit Payment Network make this an appealing update. But toolbar bugs left over from last year and the lack of a cross-platform file format leave QuickBooks 2013 less convenient than it could and should be.